When you use our online software, there's no need to worry about adding up fouls, or counting how many timeouts a team has remaining. Everything is taken care of automatically - no more mistakes and recounting, no confusion about adding things up. Your stats keepers will be relieved. No Typing - Online Instantly. When you're finished tracking stats using the app, just tap 'Save'. 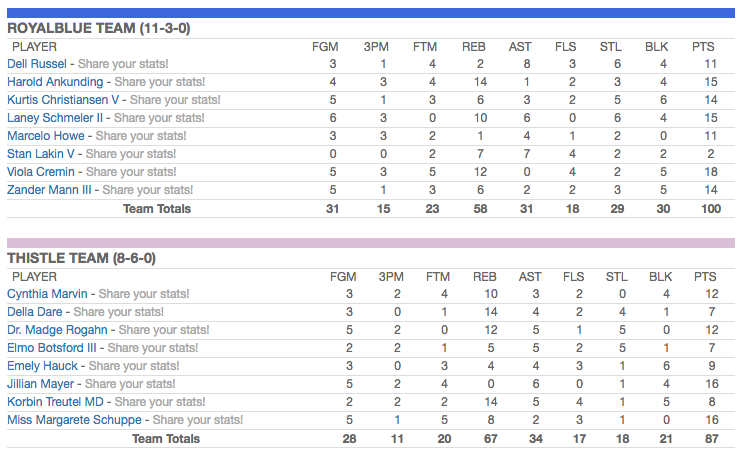 Boom - your site has all the game's statistics on our site, where anyone can view them for free. You don't have to spend hours typing away on your computer to enter in your stats. Rank Teams & Players, Analyze Game Performance. Once you've saved your stats to your league or team website, the fun doesn't stop. You can review every important stat, who contributed it, and when it happened. Our Game Log feature lets you take a deep dive into your teams stats, just like the pros. Ready to start saving hours of your time? FREE on your laptop, PC, and Mac. You can start using the app right now, by signing up for free.